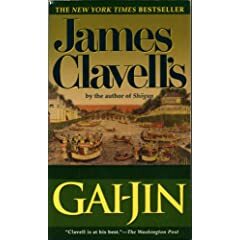 One of the ‘Asian Saga’ series by James Clavell, this book is an insight to the Japanese way of living till late 19th century. You get to hear about ‘samurai’, ‘shoya’, ‘Yoshiwara’, ‘Ronin’ etc., all part of Nippon’s social structure in feudal environment. The first disclaimer I would give is ‘if you are into racy themes, u r better off with Matthew Reilly or James Rollins’. This book is more like the ‘Culture and Human Sciences 101’ for the Japans. The story revolves around the heir apparent of the Noble House of Hong Kong who is spending good time in Japan branch of Struan’s when he is attacked by rogue samurai. The whole story deals with how life of characters revolve around Malcolm Struan (thats his name) in a complex web of actions and counter actions. 1. Its bad manners to point chop sticks at others while eating. 2. One end is used to pick up food from one’s own bowl while the other end is used to take the common dishes. 3. Business men (traders, bankers) are considered the most lowest level in Feudal Nippon though they were wealthiest among all. 4. Bushido is the code of conduct for samurai and simply means to fight for the honor. 5. A samurai never gives up his katana and Wakizashi. He will commit seppuku instead. 6. Japanese always write a death poem (the 2 or 3 poems which this book contains didn’t make any sense to me… too zen for me ) when they know they are facing death (going to war, staging a suicide attack etc.,).